Adventures of LOOKCHIN : The story of a very good friend. Its really a nice story here. Thanks for posting. Jan-Olav--what did Lookchin do for New Year's Eve? He was at home alone... (in his favorite sweater). If you were on Trollfjord, how do you know he was home...ALONE????? So THAT'S where my pink handcuffs went.. I don’t believe a word of all this pink fluffy stuff! He read all about it in “Bears’ Own Weekly” magazine!!!! 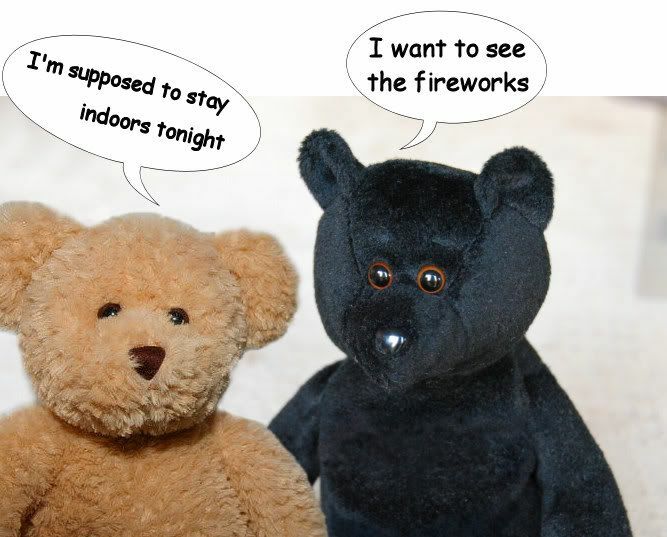 New Year’s Eve had become a problem for Wild-Bear. 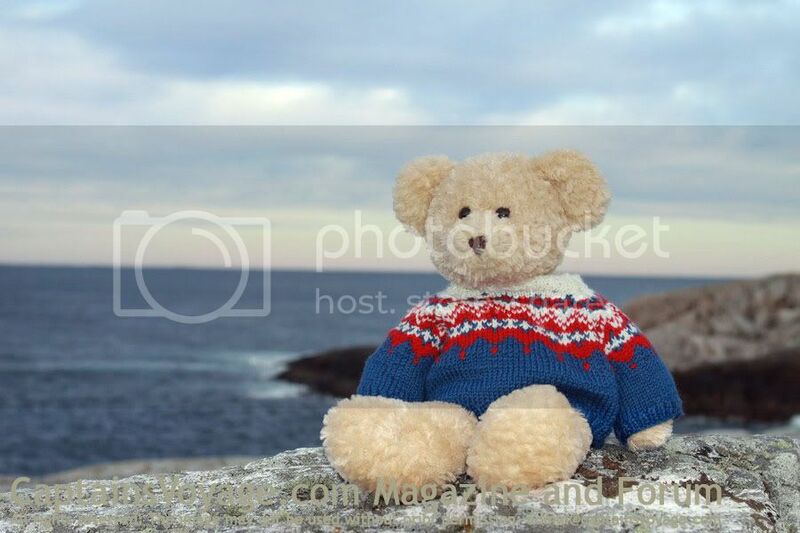 He knew he ought to invite Lookchin to the party, especially as it was his first New Year in Norway . 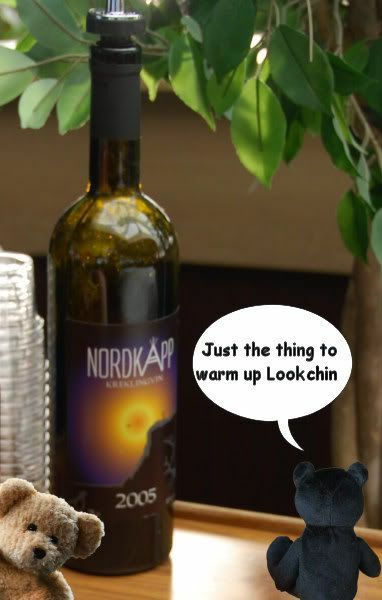 . .
After much deliberation, Wild-Bear decided to spend the evening with Lookchin – there was then a strong chance he would be able to have the She-Bears all to himself in January. It was clearly the best long-term solution to the dilemma. The two bears left the house and wandered off. After what seemed like a terribly long time, Lookchin was starting to get really worried. Lookchin was absolutely horrified. 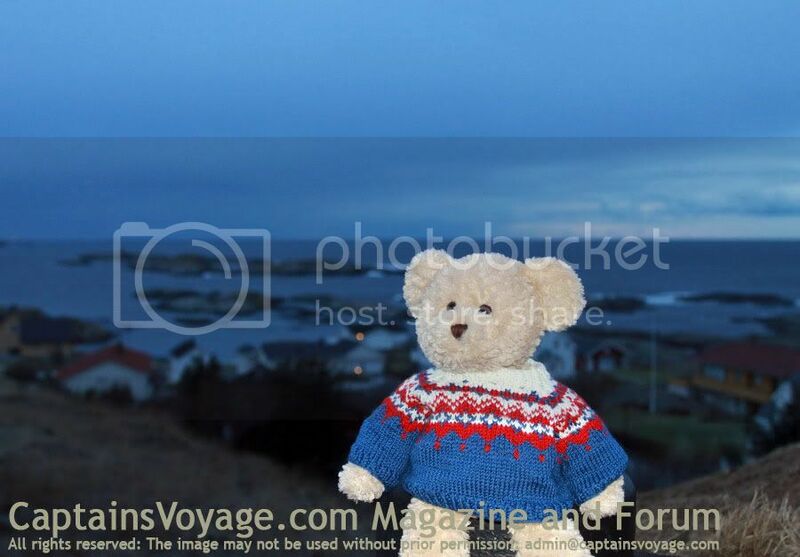 Jan-Olav was going aboard Trollfjord and would be bound to see them. Wild-Bear looked dubiously at his companion who was indeed shivering, and had actually started to cry. The evening was turning into a nightmare. Fortunately he had no idea that things were about to get worse; a very lot worse. 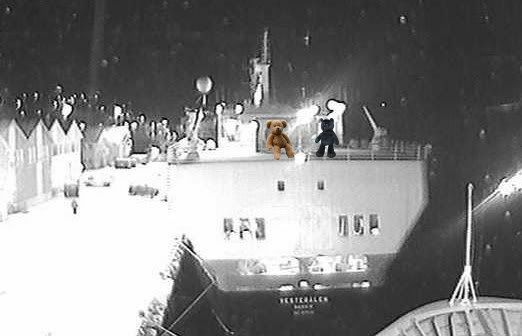 Time for PLAN V . . .
“Problem solved” declared Wild-Bear confidently as the two friends stood on the deck of Vesterålen. 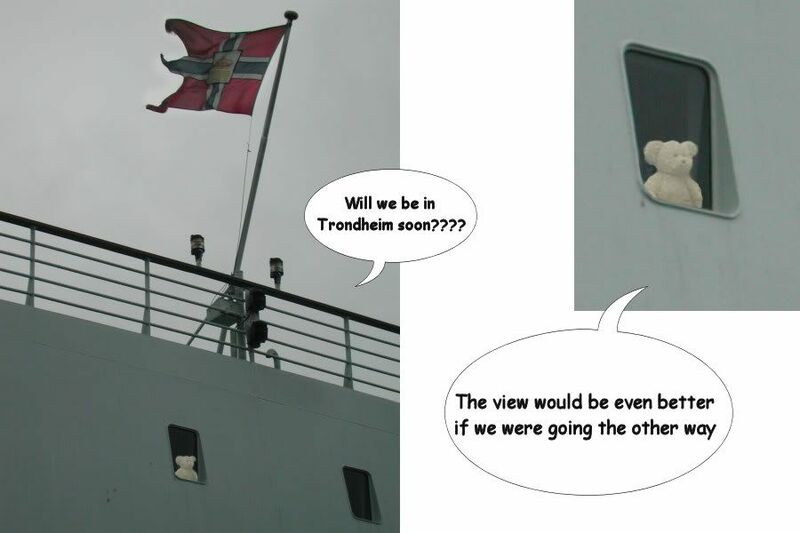 But once Trollfjord had docked, Lookchin still had doubts. 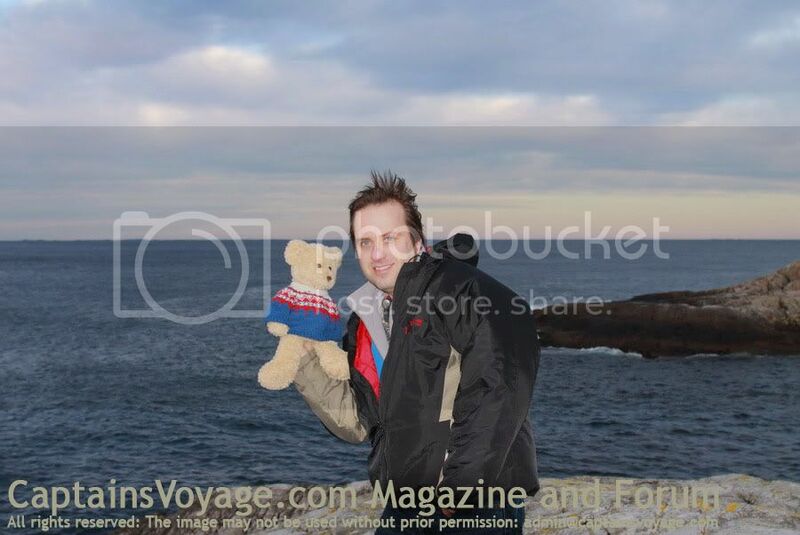 “Didn’t you read that description of Trollfjord with all the photos that Seagull posted on CaptainsVoyage old forum? – She said you can walk all round outside on Deck 6. If Jan-Olav does that he will be able to see us standing out here. And we will be seen on Trollfjord’s webcam too. And I feel so very COLD” he whined. Indeed Lookchin looked really pathetic and, without his sweater on, was shivering uncontrollably. 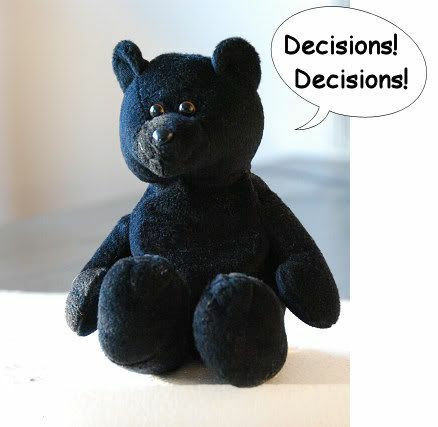 But as always, Wild-Bear had a plan for every problem. 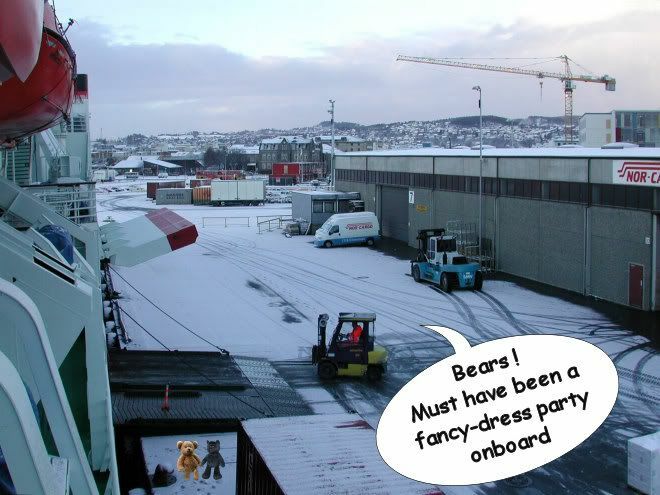 “I know a She-Bear who used to work as a chambermaid on Vesterålen” he declared. “She gave me a key-card for Cabin number 537. We will have exactly the same view from there, but it will be easier to hide if Jan-Olav shows up, and so much warmer. On the way to the cabin, Wild-Bear discovered some drinks which were actually intended for the passengers’ Neptune Ceremony when they have crossed the Arctic Circle. Just the thing to warm up his cold companion. and in no time at all, Lookchin fell fast asleep. Midnight, and as the fireworks lit up the sky all over Rørvik, not even the simultaneous hooting from the two ships could rouse Lookchin Bear. 2 hours later . . .
Lookchin slowly started to open his eyes. Then he rubbed them with his paws, but it didn’t make any difference. It remained as dark in the cabin as it was outside, although the foamy wake could be clearly seen out of their aft-facing window. And then the realisation that it was the ship that was moving. Indeed it had left Rørvik far behind and was speeding southwards. Whether from the after effects of the drink, Folla’s swell, or the seriousness of their predicament, Lookchin felt distinctly sick. “Oh do stop moaning” retorted Wild-Bear. “You can’t possibly feel sick. Didn’t you know that Vesterålen had stabilisers fitted when she was in the shipyard at Fredericia in Denmark last February? Lookchin was totally bewildered by all these facts and figures. “How do you know all this geeky stuff? – Why should I believe what you say anymore when it’s you that’s got us into all this trouble?” he sobbed. 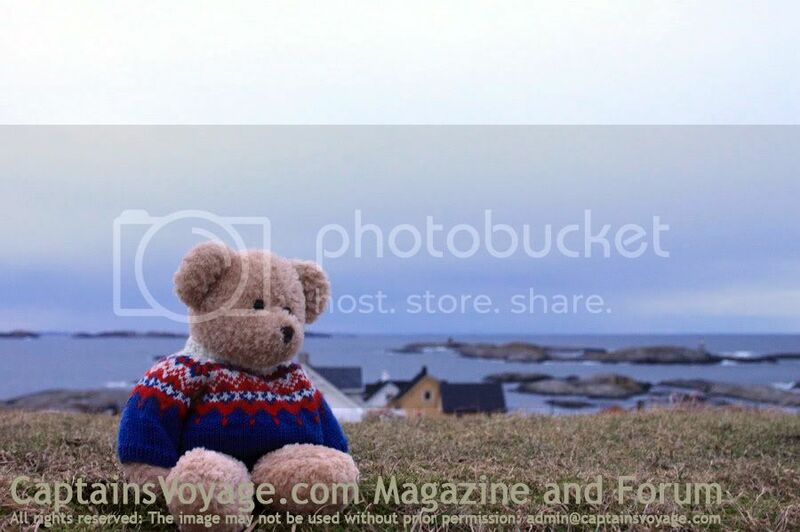 “When I was just a Bear-Cub, they used to call me The Bear who Loved Hurtigruten”. And he added that he had even been interviewed for a newspaper at the time. 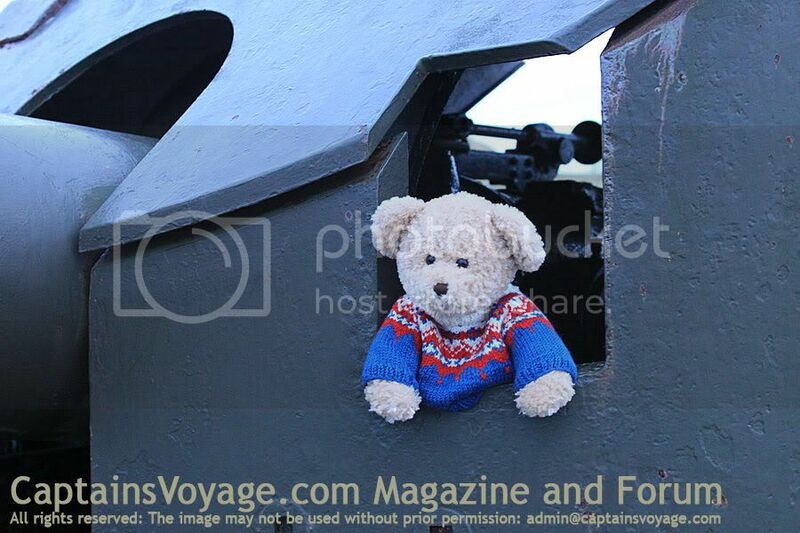 There simply isn’t an answer to such maritime erudition – Lookchin would just have to rely on such a bear to get him home safely. And indeed it all fell into place exactly as Wild-Bear had promised. In no time at all they were in Trondheim. They sensibly agreed to abstain from heading for the town centre, lest anything should happen to delay their return to the quay, and instead immediately embarked aboard Kong Harald. 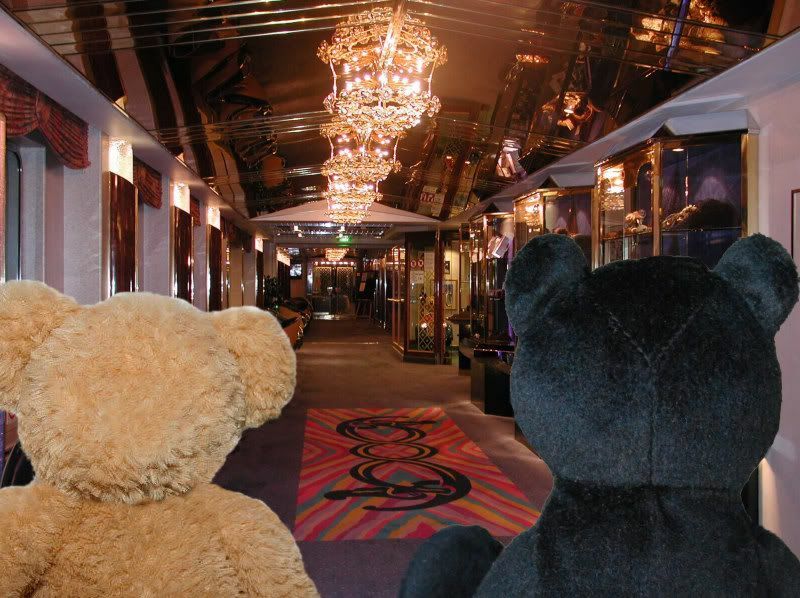 As Lookchin stood on Deck 4 looking along the starboard Coast Arcade he felt completely overwhelmed – perhaps this ship was rather too grand for him, or maybe all the experiences of the last twelve hours had finally taken their toll. 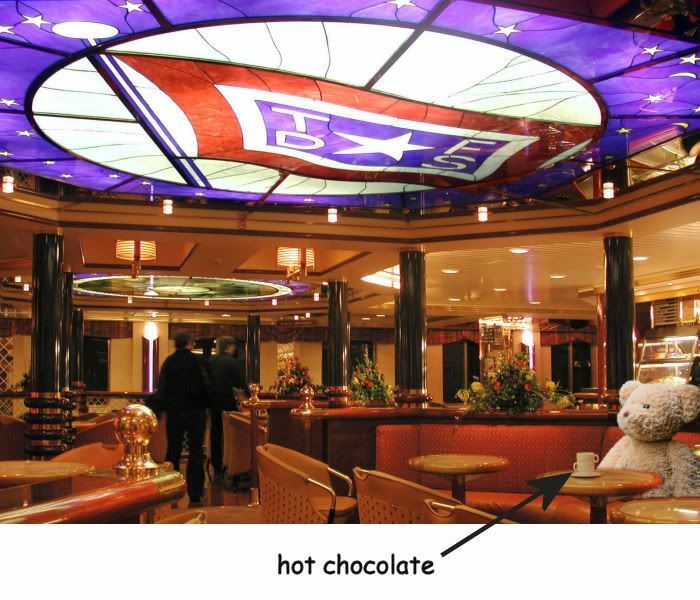 But by the time the ship set a course along the sheltered fjord, he had contentedly settled down in a comfy corner of the cafe with a very large comforting mug of hot chocolate. Yes, he knew now, 2009 was going to be a very good year indeed. Of course there was still the little matter of what awaited Lookchin back in Rørvik. Outside the house, Lissi-Cat was waiting for Lookchin, purring with delight as the two bears approached. A conspiratorial wink explained everything – the Captain had not realised Lookchin had ever been away! Absolutely no need then to worry him with the events of the last 24 hours. Lissi started mewing loudly, out came Jan-Olav to investigate, “Quick. . . Now’s your chance . . . run inside, and by the way . . . Happy New Year!” whispered Wild-Bear to his friend. “Phew!” exclaimed Wild-Bear to himself as he moved swiftly away. “That’s one adventure Lookchin could probably have done without. I'm speechless.... those posts were hilarious, simply hilarious! I won't be finished laughing for a long while: I enjoyed those posts and tales so increadibly much! WAOW... you have such a great talent! Now, I go back reading it one more time: just for the fun of it! Seagull- How hilarious!! You have missed your calling (or should I say "cawing??") -you should have been a storywriter for Disney!! Or an Animator--TOO BRILLIANT!! What an imagination!! Thanks so much for the tale! Excellent story! Especially the photographic proofs! Hard days for Jan-Olav. The spotters are everywhere! And your bear is growing up.